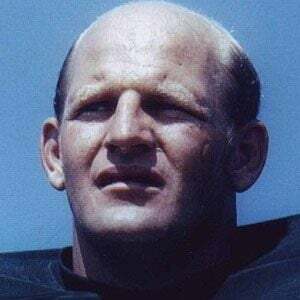 Hall of fame middle linebacker for the Green Bay Packers who was named MVP of the 1962 NFL Championship Game and was a 1964 Pro Bowl selection. He lost both his parents by the age of 14, causing a lot of trouble in school. He was offered a baseball contract by the St. Louis Browns, but chose to go to Illinois University on a football scholarship. He married Jackie Forchette in June of 1961 and together they adopted three children. He played in the 1962 NFC Championship Game under the legendary head coach Vince Lombardi.